Peter Dunning, a long standing supporter of the South Devon Railway has been made a Member of the British Empire in the 2011 Queen’s birthday honours for services to the rural community. 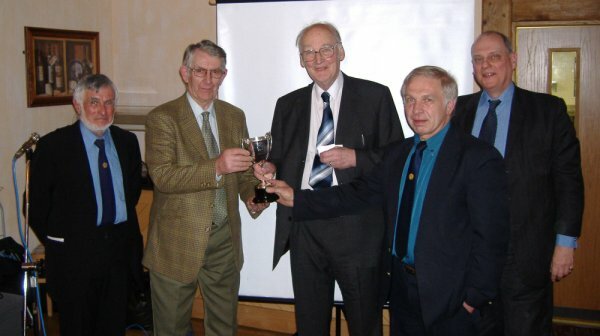 Peter was a recipient of the 2006 Patron’s cup. Peter is one of the original members of Dumbleton Hall Preservation Limited which set out to preserve the former GWR 4-6-0 “Hall” class locomotive 4920 ‘Dumbleton Hall’. Dumbleton Hall Preservation Limited trades as the South Devon Railway Trust which operates the former Ashburton branch. Peter is a regular member of the ‘Sunday’ gang which meet on alternate Sundays to help in the South Devon Railway Engineering workshops. Peter was one of those who helped with the riveting of fromer GWR coach 2180.